For Chow Yun-Fat, the 80s meant the big breakthrough as a movie star, both in Hong Kong and internationally. The movies made with John Woo received more attention in the West after The Killer came out but in Hong Kong the interest was also, if not more geared towards his drama and comedy roles. His by far best drama performance comes in An Autumn's Tale, the awardwinning romance by Mabel Cheung (Eight Taels Of Gold). Jennifer (Cherie Cheung) is a shy and a bit naive woman who after two years of saving is moving to New York to study acting. Over there she is also going to reunite with her boyfriend Vincent (the late Danny Chan). Her family has arranged for her to live in the same apartment block as distant cousin Figgy (Chow Yun-Fat) who they think is some sort of local leader in Chinatown and therefore rich. What we have here is a simple little story made big because everything literally gels! Heck, even some of the gwailo actors do some form of commendable work! Mabel Cheung's direction is quite minimal which allows for a very welcome subtlety that relies much on the chemistry of its main stars. Chow Yun-Fat and Cherie Cheung feels so genuine together that you often think you're actually looking at these two characters but at the same time two superb actors at work. Not an easy combination to achieve. Much of this is also due to Alex Law's sensitive script that allows the New York setting to enhance the very simple characteristics of the bond that happens between Figgy and Jennifer. 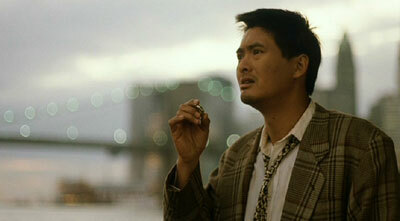 In my opinion, this is Chow Yun-Fat's best performance to date. Figgy is not a complex character at all but that is what makes him speak more to a true reality rather than a movie one. Playing an ordinary human with ordinary needs is the hardest kind of acting and it takes great focus directing-wise to pull it off. Only a few actors could've have done justice to Figgy. Chow Yun-Fat is one of them. Cherie Cheung's acting can be a bit harder to grasp since her character goes through this rollercoaster of emotions throughout the film but both the naive and tender side to her character is handled with great aplomb by the actress. It's not only the actors who shine bright in this movie. The awardwinning cinematography by James Hayman (with additional photography by David Cheung, presumably responsible for the Hong Kong shoot) has exactly the type of look I love. It's not done in a fancy way and it almost feels like it's natural lightning throughout. Since it's a simple story the cinematography should reflect that subtlety on behalf of Mabel Cheung and it does tenfold. If you want beauty, go see a Zhang Yimou movie however! New York is a beautiful place but set in rubbish environments for a reason. No less magical of a romance despite. Lowell Lo's simple but beautiful piano music fits perfect also. Mabel Cheung's movie is a true romance classic not only in Hong Kong Cinema but also World Cinema. It's a film you'll fall in love with on every viewing and needless to say, this is THE favourite movie of mine. Period. Fortune Star continues their series of remastered Hong Kong classics, distributed by IVL. The 1.78:1 framed anamorphically enhanced transfer exhibit some vertical and horizontal cropping compared to other versions available but it doesn't greatly affect the viewing as compositions still look good. Sharpness and colour balance registers high and the only real downside is the appearance of mild grain in places. It's usually not a detraction and something most likely due to the shooting conditions and what stock that was originally used. Print only has minor damage so this remaster is a fitting tribute to a classic work. IVL have come under a lot of heat, rightfully so, regarding their audio presentations on the remasters. It is in regards to the original 2.0 mono tracks that have more often than not been out of sync with the picture. Action movies obviously have ample opportunity to display this authoring flaw while efforts like Rouge (where the track seemingly was in sync however) and this you have to look harder for those few moments. To my ears, this presentation is synced for roughly half the picture and then it ever so slightly shifts to appearing after the action on screen. If you're not looking for, you might not notice it but it's definitely once again an inexcusable flaw, even if it's just for the latter half of the film. The track otherwise sounds clear with dialogue and music being faithfully presented. Dolby Digital 5.1 and DTS 5.1 remixes are also available and are in proper sync. The opening of the soundstage isn't terribly intrusive but I always like to experience original rather than tampered sound. A Mandarin Dolby Digital 5.1 dub is also available. The English subtitles will be familiar to owners of the prior Megastar disc (that had the subtitles go out of sync for a good portion of the film). Translation is obviously cleaned up although some minor grammar errors appear. Some changes occur such as the reference to Woody Allen by Danny Chan's character and here Chow's Figgy responds thinking he was mentioning Alan Tam. The English spoken dialogue mostly appears in the subtitles as well but do not always match word by word. Traditional and simplified Chinese subtitles are also included. A newly created trailer as well as the original is included. Too bad the producers of the newly edited one totally missed the mellow mood of the feature and the whole affair feels more like a hard boiled romance now. Thankfully the original stays more true to the intended mood. A 20 page photo gallery consisting of stills from the film is also included (an automatic slideshow set to Lowell Lo's music exists for this extra as well). Fortune Star's created trailers for Rouge and The Killer rounds off the disc. The Limited Edition package comes in an autumn style packaging functioning as a poorly designed photo frame for the 6 double sided photos from the film (some of which has quotes from the movie printed on them) and the 2005 calendar card. A HK$50 Gift Certificate at Crabtree & Evelyn shops is also stuffed in there. Yesasia shoppers are also offered a music box with this package.